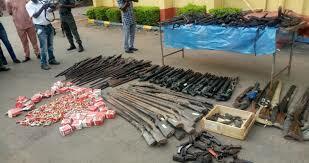 The Ebonyi State Police Command said on Wednesday that it has destroyed a gun making factory in the state. The police also recovered a cache of 146 prohibited firearms and assorted ammunitions that were hitherto in possession of unauthorised persons in the state. The state Commissioner of Police, Titus Lamorde, said the arms were recovered following the Inspector General of Police, Ibrahim Idris’ directive to all police commands and other formations to mop up illegal firearms and ammunition in circulation nationwide. He said the Command set up a task force headed by a Deputy Commissioner of Police in charge of Criminal Investigation Department, Oyeyemi Oyediran. Lamorde said the police acting on a tip off destroyed a factory where guns were manufactured at Mgbo in Ohaukwu local government area of the state. “The Police acting on a tip off discovered an arms making factory in Mgbo and on getting there the owner ran away. But we recovered some of the locally made arms there,” he said. The police commissioner commended those who voluntarily surrendered their arms and urged others still with theirs to submit them immediately.